Thanks to Jorge Cwik who's joined our preservation and modeling effort, we've got a complete set of polygons for our Motorola 68A00P, made in 1986. Jorge worked in a standard vector drawing app, Corel Draw, and has written scripts to help with the work. He's provided data in SVG as well as extracted a netlist for the chip. 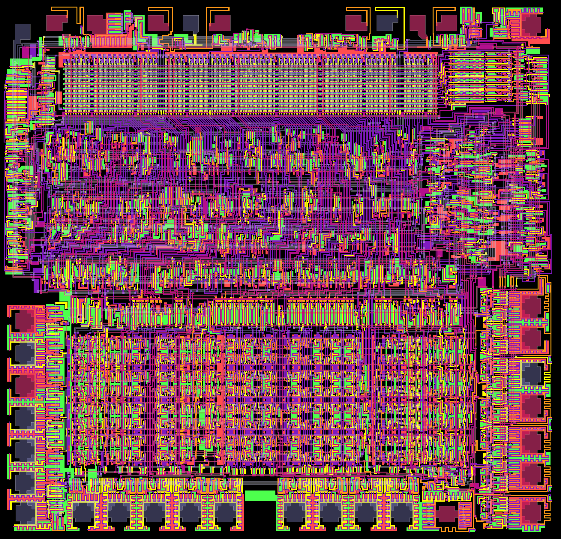 After converting to our visual sim format, many folks on the Visual6502 team helped debug the netlist and bring the chip up in simulation. 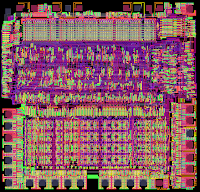 Our wiki entry for the chip links to the simulation and other 6800 material. Enjoy! Even better - Jorge is eager to get started on other chips, and in fact, he started modeling a famous Atari chip before discovering our project. Way to go, Jorge! Good stuff, wish there was a schematic in case a guy wanted to build one of these out of descrete transistors, yea about 4k+ of them, but wow, what a fun project to build a CPU like that, Suppose if you had enough 12AX styles of tubes you could really get retro. By the way, do you have a schematic of the chips you have done? These are also available on our github site, linked from the sim page. Any chance of getting the original SVG image? I see the wiki page shows JPG renders of them, but they include compression artifacts. I also tried parsing the data from the JS sim, but it doesn't include all of the geometry (such as vias/contacts and the power/ground metal wires).